1236 Army Farrier qualification badge. British Army. Farrier qualification badge. Colour. Household division version [code 1236hd] also ..
1238 RMSM Student badge. Colour. 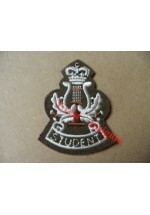 RMSM [royal military school of music] Student's badge. Colour. 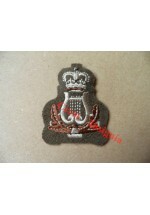 Qualified musician [code 1239] als..
1239 Army Musician trade badge. British Army. Qualified Musician's arm badge. Colour. RMSM Student [code 1236] also available. ..
1241mtp. Para Trained 'Lightbulb' patch. MTP. UK Forces. 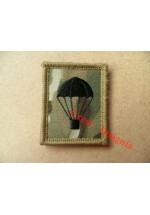 Parachute trained personnel qualification badge. MTP. Velcro backed. Colour version [..
British Army. Air Dispatcher qualification wings. Colour. 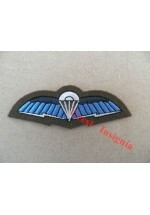 MTP version [code 1248mtp] also availab..
1248mtp Air Dispatcher Wings Brevet. MTP. British Army. Air Dispatch personnel qualification wings. MTP. Velcro backed. Colour version [co..
British Army. QADI [qualified air dispatch instructor] brevet wings. Colour. 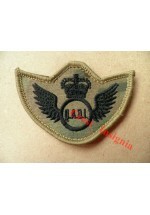 MTP version [code 12..
1249mtp QADI wings, velcro backed MTP patch. British Army. QADI [qualified air dispatch instructor] wings brevet. MTP. Velcro backed. Colour ..
1250a SF Communicators wings. Army. British Army. 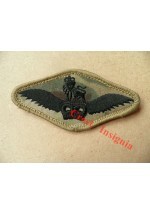 Special forces communicators wings. Army version. Royal Navy [code 1250rn] & RA..
1301c 1st [UK] Armoured Division TRF, colour. British Army. 1st [UK] Armoured Division TRF patch, colour. 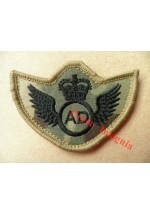 Subdued version [code 1301s] also ava..
1301s 1st [UK] Armoured Division TRF patch, subdued. British Army. 1st [UK] Armoured division TRF patch, subdued. Colour version [code 1301c] also ava..
1302c 4th Infantry Brigade TRF, colour. British Army. 4th Infantry Brigade TRF patch, colour. Subdued version [code 1302s] also available..
1302s 4th Infantry Brigade TRF, subdued. British Army. 4th Infantry brigade TRF patch, subdued. Colour version [code 1302c] also available..
1303c 7th Armoured Brigade TRF, colour. British Army. 7th Armoured Brigade [the desert rats] TRF patch, colour. Subdued version [code 130..
1303s 7th Armoured Brigade TRF, subdued. British Army. 7th Armoured Brigade [the desert rats] TRF patch. Subdued. Colour version [code 130..
1304c 20th Armoured Brigade TRF, colour. British Army. 20th Armoured brigade TRF patch. Colour. Subdued version [code 1304s] also av..
1304s 20th Armoured Brigade TRF, subdued. British Army. 20th Armoured brigade TRF patch. Subdued. Colour version [code 1304c] also availabl..
British Army. 42nd [North Western] Brigade TRF patch. Colour Subdued version [code 1310s] a..